Laura is a 25 year old nonpracticing psychologist. As a hopeless romantic she loves to write, dream and wander around the city looking for new adventures and inspirations. Stay tuned for an inside peek into the daily life of one of Amsterdam's inhabitants! 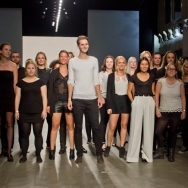 This Thursday I found myself at the centre of fashion Walhalla in our own little capital: Amsterdam Fashion Week 2012! 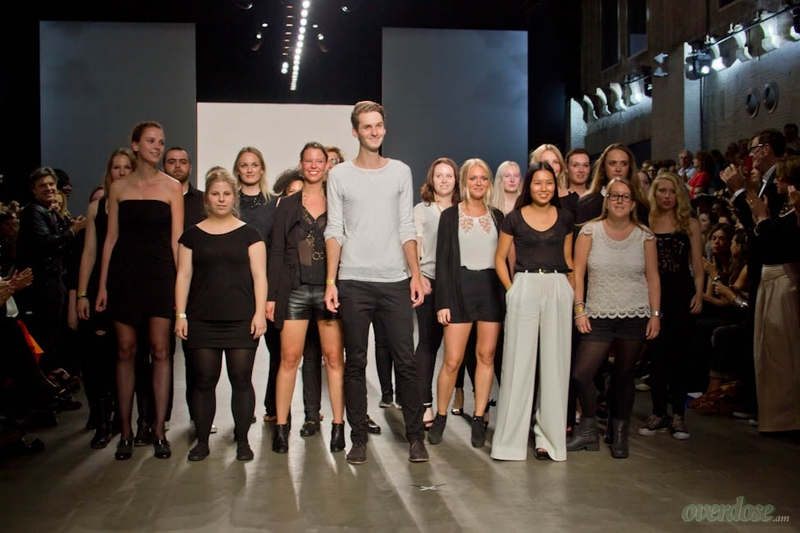 My very first fashion show was the presentation of the Amsterdam Fashion Institute’s Individuals Collection. There I was, sitting on a very uncomfortable bench, next to fashion bloggers, famous Dutchies, and loads of other awesome looking people. While my photographer was struggling for a good position on the so-called monkey rock, the lights dimmed and the loud electronic music started to play. Lights, camera, action! In almost complete darkness, only a few shimmering lights, the first models appeared on the runway. It was clear, even for a fashion-noob like me, that the theme was all about cool nomads, dressed in sturdy, manly outfits. 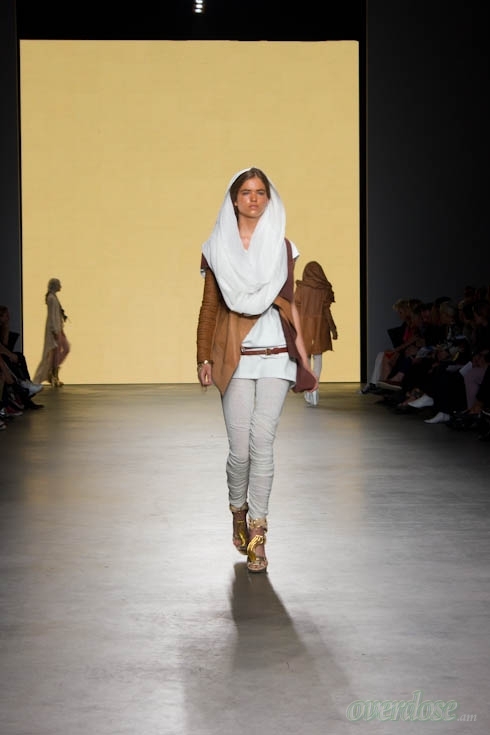 The models looked a little (fake) tanned, as if they had just taken a three hour walk through the Sahara. The hairstyles were mostly big and messy, sometimes even a little dirty looking. The style was very comfortable, baggy and casual, but very powerful at the same time. The accessories were definitely a big part of the outfits, lots of big leather bracelets and golden necklaces. The colour of the outfits started off with lots of grey and black, made a transition into bordeaux, and ended with more white and beige tones. 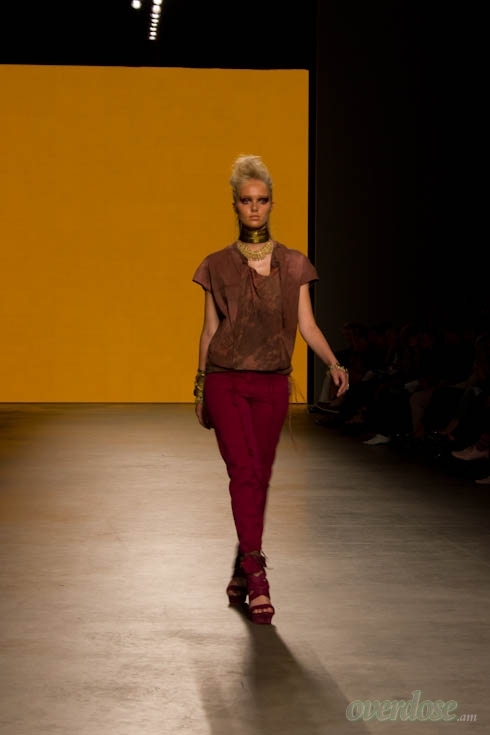 While the first outfits were a somewhat androgynous, the style slowly shifted into a more feminine look. Lots of beautiful white Egyptian dresses and golden skirts. 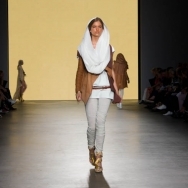 After a while even a couple of turbans passed the catwalk. That moment, when they walk hand in hand with the designer, while the crowd applauds and praises the collection..
All this time I was sitting on the bench, and the room started to get hotter and hotter. As the show continued, everyone was getting sweatier, and at the end I was feeling a little Sahara myself. Like in all fashion shows, the spectacle finishes when the designers step on the runway, together with the models. This is, so far, my favourite part of the show. At this moment, you can really sense all the work that the designers have put in the collection. After all the models passed the runway, all with straight faces, looking very professional, there is finally some emotion at the end. That moment, when they walk hand in hand with the designer, while the crowd applauds and praises the collection, was maybe the most impressing moment of the whole show for me. Three more days of beautiful people, free champagne and a lot of interesting couture to discover; let’s see if the next show will change my opinion!